It wasn’t long ago when communicating with someone over a long distance meant sitting down with a pen and paper and writing a letter. When the letter was finished the sender had to fill out an envelope add a stamp and go to the post office to mail it. A few days or a week later, the recipient would receive the letter and reply using the same process. In the 1990’s the Internet became mainstream and email was adopted. People could instantly send electronic messages with a simple click and received a reply within minutes and not days. This electronic communication took some time to be adopted as mainstream but it was a faster, cheaper and more reliable method of communication. People instinctively take advantage of the better tools at their disposal as newer technologies replace older ones. This is the reason that people today are increasingly excited about blockchain technology and digital or crypto-currencies. Blockchain platforms and the technological advances they provide for digital currencies are improving every day. In the near future blockchain-based crypto-currencies, could redefine how businesses and individuals transact with one another. Paper based transactions could become a lot less relevant much the same way that letter writing was replaced by email. As the global economy evolves towards a paperless digital eco-system, digital currencies are positioned to evolve alongside it. From investments to money transfers, everything is going paperless. The newest and most promising addition to the digital payment sector is the crypto-currency. Digital currencies have an advantage over traditional fiat currencies (any money declared by a government to be legal tender) because, future supply is more predictable and supply is regulated and enforced through cryptography and a consensus rule mechanism. Additionally, digital money can be instantly directed anywhere in the world at virtually no cost and without the need for a financial intermediary. When a digital currency is created, all transactions are stored on a public ledger across the network. Here the identities of the members in the network are encrypted to ensure legitimacy of record keeping. The ledger verifies that all transactions are legitimate between the parties by verifying it through their digital wallets. All transactions are instantly verified by everyone on the network to confirm that, the utility token belongs to the purchaser. These digital transactions are supported through encryption employing smart contracts, which renders them virtually un-hackable, protecting them from being hacked by cyber-criminals or being counterfeited. Furthermore, since these digital currencies are decentralized, there is no central authority or government that can take the currency away from you. 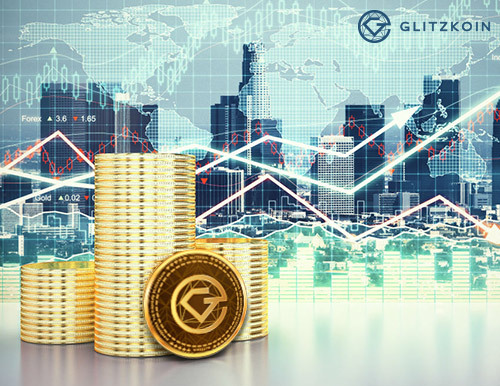 The GLITZKOIN project is geared to deliver a blockchain based diamond trading platform. This secure environment is equipped with a crypto currency to settle payments due for transactions that occur on the platform. By lifting diamond trade to an entirely new level, the project has the potential to significantly expand global diamond markets. The crypto currency, diminishes the need for the banking system. This obviously means a steep reduction in bank fees and currency conversion charges.